The 9/11 Memorial Museum is commemorating one of the darkest days in our nation's history in the best way it can: With a commemorative cheese plate that will remind you of your freedom every time you it down to a delicious slice of Brie or a sliver of Gruyere. 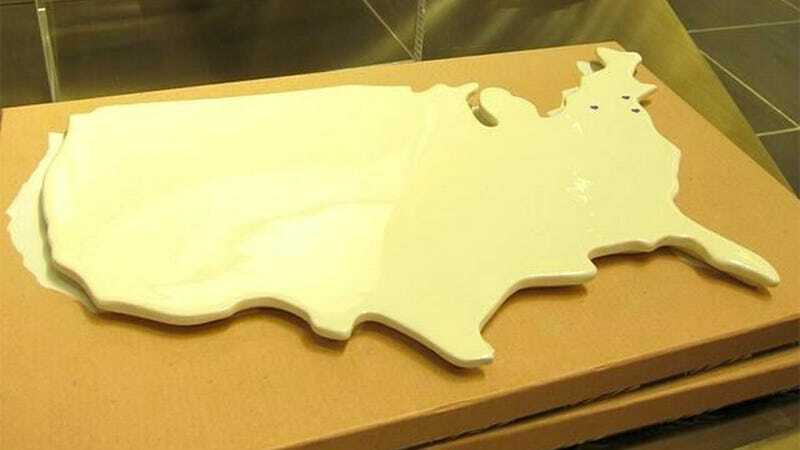 The cheese plate is in the shape of the continental U.S., with hearts where the attacks hit NYC, DC and Shanksville, Pennsylvania. Because no cheese course is complete without a moment to "Never forget" (to take our Lactaid). Let's roll... that wheel of cheddar to Freedomtown? Michael Frazier explained the Washington Post that the items in the shop were "carefully selected... To care for the Memorial and Museum, our organization relies on private fundraising, gracious donations and revenue from ticketing and carefully selected keepsake items for retail." He also noted that during the period where 9/11 workers, survivors and victims' families visited the museum, "[m]any of our guests from the 9/11 community have visited the shop and purchased a keepsake from their historic experience." Somehow, I doubt that anyone purchased the cheeseplate.